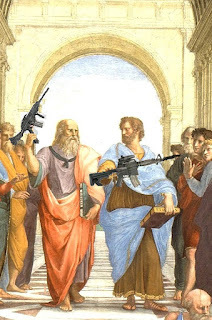 In today’s permissive society, modern conservatives have become a target rich environment for the Alinskyite, whose 13th rule (“Pick the target, freeze it, personalize it, and polarize it.“) has been getting a thorough workout against the 2nd Amendment. But as with ill-mannered children, their getting away with what they want, depends upon your willingness to play along with them. If you don’t, if you focus them upon what they are trying not to mention, if you discipline their ‘facts’ with a little bit of knowledge… it can all become very embarrassing for the poor little lefties, very quickly. And for people accustomed to thinking of themselves as the smartest people in the room… that tends to lead to some very entertaining hissy fits (see Piers Morgan… there’s certainly no better reason to see him). No one who thinks that they’re outsmarting you, much likes being forced to own up to the bill of goods that they were hoping to get you to buy for them, free of charge. The trick to getting this sort of free entertainment, is to listen to their statements – less for what they’re saying, and more for what they are trying so very hard not to say… which is,surprise, what they want you to own up to as being discredited by what they are saying. Let’s take a recent example and see if you can spot, in this prime piece of putzery from the uber-leftist Thom Hartmann (as the failed Air America host is brought to you by RT… that’d be ‘Russia Today’… Pravda… hellooo)), what he is working so hard NOT to mention… but which he really, really, wants you to think of as having been discredited by what he is saying. Did you notice what he doesn’t mention? If you listen to the whole video, you’ll hear the same thing repeatedly not mentioned throughout his entire piece. Yep, that’s right, he never mentions what the 2nd Amendment means. He doesn’t mention whether or not it is a valid Right, he doesn’t mention whether or not it is a ‘useful’ Right, he certainly doesn’t mention whether or not those ‘slave patrol militias’ would have been too likely to have been patrolling for slaves if those slaves had had the right to bear arms themselves… or what lessons that might provide us… no no no, the only thing he wants to ‘discuss’, is that the ‘real’ reason the Framers wanted to add a right to bear arms, was to get Virginia on board with the constitution, by helping to preserve slavery. As I said last time, this is truly evil stuff, selectively using facts not to illuminate, but to obscure the truth and prevent understanding, in order to eliminate what is Good (your Right). And yet that is exactly what “Pick the target, freeze it, personalize it, and polarize it. “, is all about – figuratively throwing a rhetorical fit in the aisle of the supermarket of ideas, so that, embarrassed, you’ll give them the candy they want. What you, as someone concerned with preserving liberty need to do, is to recognize what it is that they are doing, recognize that all of their stomping about and name calling, is done to unjustly discredit your position, without ever having to actually deal with it themselves – that is Saul Alinksy’s 13th rule in action. That the left favors this tactic, is an indictment all its own. The ‘real reason‘. Really. Is that why the first states to demand a bill of rights protecting the right to bear arms, demanded them before anyone knew what Virginia might do? And if it was somehow was sought to protect ‘slave patrol militias’ in Virginia, why did the individual states already have the right to bear arms protected in their own constitutions? Were these Yankees just generously anticipating the southerners wishes? Or was it something which they all had such a deep familiarity with, the difficulty of securing the hard fought right to keep and bear arms, a right that had to be continually re-fought over the centuries, was important? Was the ‘real’ reason for that… to get Virginia on board as a state in a nation not yet conceived of? As some sort of pre-conspiracy conspiracy? What concern did New Hampshire or Pennsylvania have with slave patrols… except to be doubly sure not to let a tyrant make slaves of themselves? Again, we could keep this going back to much earlier colonial rebellions, where the rights of Englishmen were in continual struggles against the crown’s attempts to disarm the populace, which when frustrated, sought to use restrictive hunting laws to accomplish their disarmament under cover of ‘common sense’ regulations. Or we could go back to Locke, Sydney, Grotius… Aquinas, Cicero, even back to Aristotle and the Athenian tyrant (and extreme democrat) Pisistratus’ crafty trick for disarming the populace. Or maybe we could come forward in time to the ‘real’ reason that the 14th Amendment was passed, so that the newly freed slaves would be made citizens with all the rights, immunities and privileges of citizens of the US, especially including the 2nd Amendment, no matter which state they lived in. No no no, not those framers he’d doubtlessly say, they have no lessons for us to learned from, fuhgedaboud how the democrat party spawned Ku Klux Klan was formed to strip the former slaves of their new found liberty, and the republicans of their political power, to keep them all in a condition just as defenseless as slaves – unarmed. No… nothing to see there, move along. We could go into those ideas behind the 2nd Amendment, but there’s no real reason to. Why? Because he isn’t engaged in reasoning and is in fact doing everything he can to avoid being sucked into such a dangerous pursuit. The arbitrary charges and aspersions he casts, with an isolated factoid or two for decoration, are not meant to provide coherent evidence, but to keep such things at a safe distance – that is the whole point of “Freeze it, Personalize it, Polarize it“, to prevent thought and to instigate emotional reactions – and it is nothing new. Only the ignorance of the proRegressive left, could allow them to think that Alinsky’s rules were something new. …I have much confidence in the instincts of the slaveholders. They see that the Constitution will afford slavery no protection when it shall cease to be administered by slaveholders. They see, moreover, that if there is once a will in the people of America to abolish slavery, this is no word, no syllable in the Constitution to forbid that result. They see that the Constitution has not saved slavery in Rhode Island, in Connecticut, in New York, or Pennsylvania; that the Free States have only added three to their original number. Notice the many ellipsis… I’ve omitted much, all of which is very much worth your attention – I urge you to read it in full, you not only won’t be sorry, you’ll be rewarded for doing so. 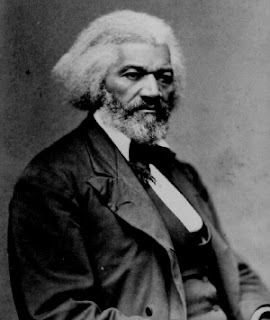 They use the tactics of an 8 yr old, because that is who they have made themselves into, and they are confident, ignorantly so, that you are in no better condition than they are, or than Frederick Douglass was as a newly escaped slave, and these princes of putzery are so assured that you will not banish their shadows with embarrassing light, because for a decade of decades, they have influenced and then controlled the lack of Education present in your schooling. They have so fervently been seeking to transform you into being the ones they’ve been waiting for – for well over a century (and which they continue to pursue through Common Core Standards) now – because after all, when everyone has been made childish, then the most childish wins. One of the things you notice when reading the modern left, is just how intent they are at driving everyone’s conception of what one ought to do, down the intellectual scale towards the perceptual and away from the conceptual, towards pleasure and pain, over Right and Wrong, or put another way, towards the childish and away from the mature. Few have explained so well, or so brazenly, how to accomplish that, than the pied Piper of childishness, Saul Alinsky, whose “Rules for Radicals” strip rhetoric, ethics and politics, of all hierarchy, transforming the conceptual into the perceptual, and preparing a people not only willing to use his tactics, but to put up with them. Pick a target. Does that mean analyze and isolate the essentials of your opponents argument? No, that means slap it with a recognizable label that communicates nothing of it’s meaning. Sadly, in today’s world, “2nd Amendment” doesn’t mean a fundamental protection of all of our rights, what it means today is “Gun nutz!“. Freeze it. Does that mean taking care to summarize the opposing argument as best you can, in as timeless a manner as possible? Nooo… not quite. It means to tag your opponent with as unforgettably offensive or alarming a term as possible (“ASSAULT RIFLE! TANKS! CHILD KILLERS!!!“). Personalize it. Does that mean that you should examine the parts of an issue that people will most identify with, and explicate them? Nope. It means slap it as a charge upon YOU! , you, you toothless & ign’runt, knuckle dragging, cracker of a conservative you! Polarize it. Does that mean that you should carefully examine it’s Pro’s & Con’s? Nope. It means to tar you and your issue with promoting something offensive or to embarrassing to be associated with, so that no one will want to associate with it, or with you (“How can you be for endangering the lives of little children! What an offensive ideology! No civilized person can tolerate this!“). It is pure childishness, and the more immature and childish it can be made, to their mind, the better. For an opposite approach, one that carefully examines the historical record, preconceptions and misconceptions in order to make a reasonable case for your position, see here. You may or may not agree with the author’s conclusions, but you can understand his position and determine for yourself what value you think it does or doesn’t have, because he presents a reasoned approach, whose premises are supported by facts that are rooted in the context of the historical record. Which is the exact opposite of the Alinskyite ‘guilt by association.’ and insult – not using the power of persuasion, but the persuasion of power… and they have no compunctions against moving from assaulting your ears, to assaulting your person and property. Especially if you lack the means to defend yourself. The left, especially the more modern proRegressive left, is rooted in the pursuit of power for powers sake, which shouldn’t be all that surprising, for the pursuit of power, the desire for power, is a childish attribute… a desire to get your way, rather than having to bother with doing what is right. That’s something to keep in mind, that “The limits of tyrants are prescribed by the endurance of those whom they oppress“. Yep. And seeking to obstruct the liberty of others, is what makes you a tyrant. Or a wannabe, at any rate. Don’t forget that one aspect of what people will submit to, is what they are ignorant of, and the absence of the idea that it ought to be different. Ignorance is the best friend of those seeking to gain over over you – hence the methods and content of our schools today, and so very many yesterdays as well. But a little light goes a long way. And in recognizing it as a Right, as opposed to a privilege, you must also realize how inappropriate it would be to try to justify that Right on the basis of ‘needs’, right? I mean, you wouldn’t try to justify the right to freedom of speech, upon what you need to say, right? No more than you would question Rosa Park’s Right to sit in the ‘whites only’ bus seat, on the basis of her needing to sit there, right? “…But with respect to our rights, and the acts of the British government contravening those rights, there was but one opinion on this side of the water. All American whigs thought alike on these subjects. When forced, therefore, to resort to arms for redress, an appeal to the tribunal of the world was deemed proper for our justification. This was the object of the Declaration of Independence. Not to find out new principles, or new arguments, never before thought of, not merely to say things which had never been said before; but to place before mankind the common sense of the subject, in terms so plain and firm as to command their assent, and to justify ourselves in the independent stand we are compelled to take. Neither aiming at originality of principle or sentiment, nor yet copied from any particular and previous writing, it was intended to be an expression of the American mind, and to give to that expression the proper tone and spirit called for by the occasion. All its authority rests then on the harmonizing sentiments of the day, whether expressed in conversation, in letters, printed essays, or in the elementary books of public right, as Aristotle, Cicero, Locke, Sidney, &c. The historical documents which you mention as in your possession, ought all to be found, and I am persuaded you will find, to be corroborative of the facts and principles advanced in that Declaration. …. That tyranny has all the vices both of democracy and oligarchy is evident. As of oligarchy so of tyranny, the end is wealth; (for by wealth only can the tyrant maintain either his guard or his luxury). Both mistrust the people, and therefore deprive them of their arms. Ask yourself one question, next time you hear someone talking about limiting the right to bear arms… who is it that is most likely to be considered necessary to be kept in a defenseless state – a free man? or a slave? The one assault weapon that is even more useful than an AR-15, is an informed mind. What are you doing to arm yours? Have I mentioned that the ammunition is free? See the links above, and lock & load.